Welcome ladies and gentlemen to this most exquisite event. 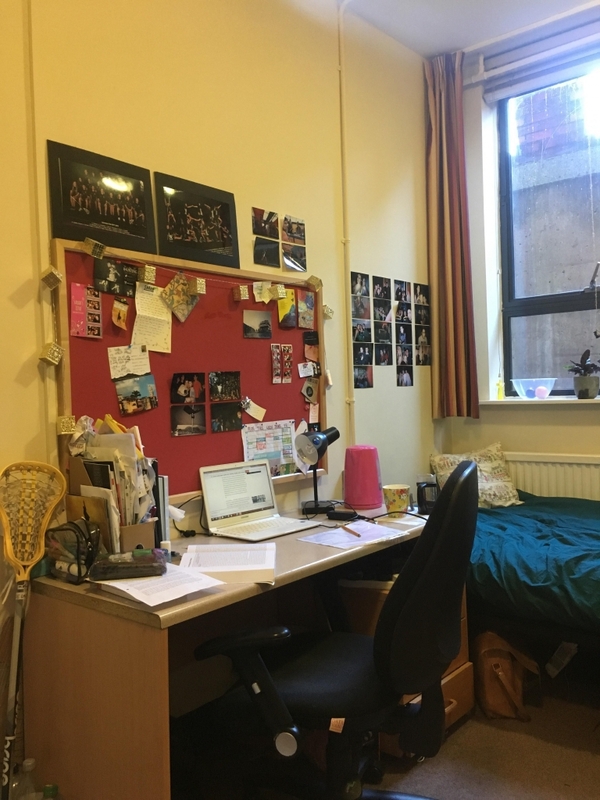 Lent Term is already in its final stretch and it has been seven months since we moved into LSE Rosebery Hall. Between long brunches, Sunday mornings eating pancakes in the kitchen and birthday celebrations, this experience has been a blast. 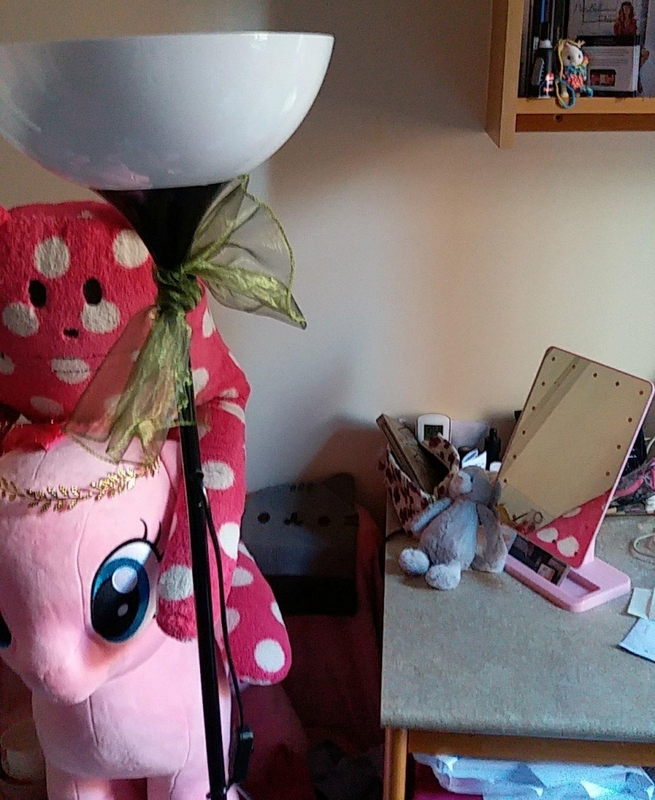 You can read all about my Rosebery life on this post I wrote last semester. 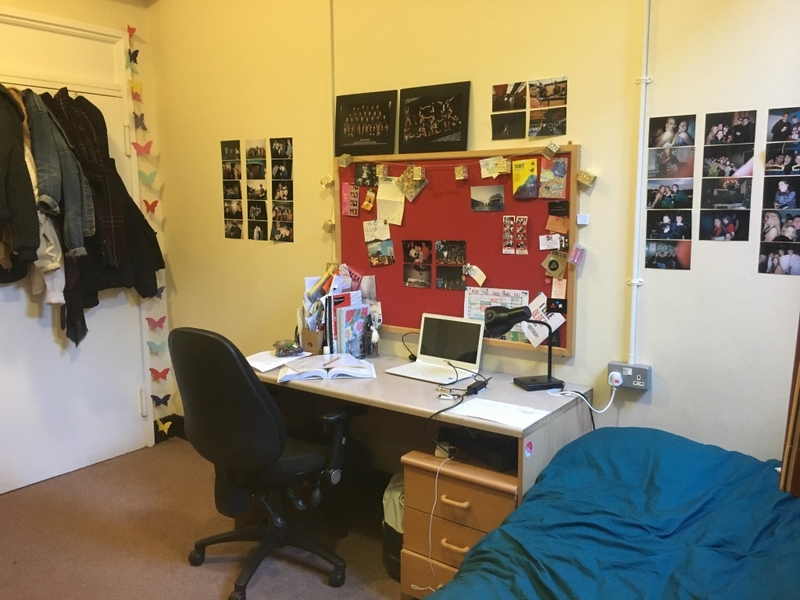 When we move into halls we are faced with a clean sheet of paper shaped like a room and we can do whatever we want with it. Apart from the ugly curtains, there is little that separates one room from the next though, at first they look all exactly the same. But we create ties to where we are living, we transform our surroundings and make it look a little bit like home. I love to visit my friends’ rooms and see the little things that they add to it to make it resonate their personalities. This was the inspiration for this post. 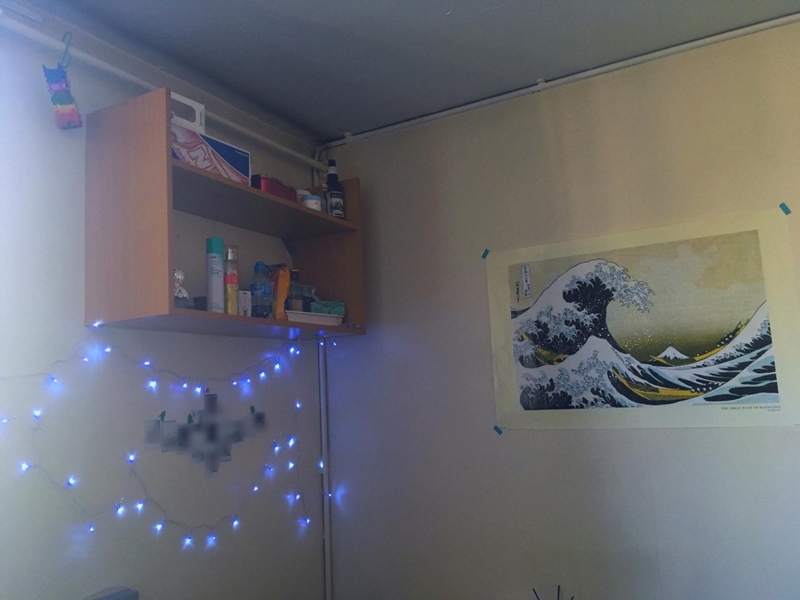 I asked my fellow inhabitants of Rosebery to send me a picture of what they have done to their room that is unique and reflects who they are. This composition shows a very unique sense of beauty and proportion. 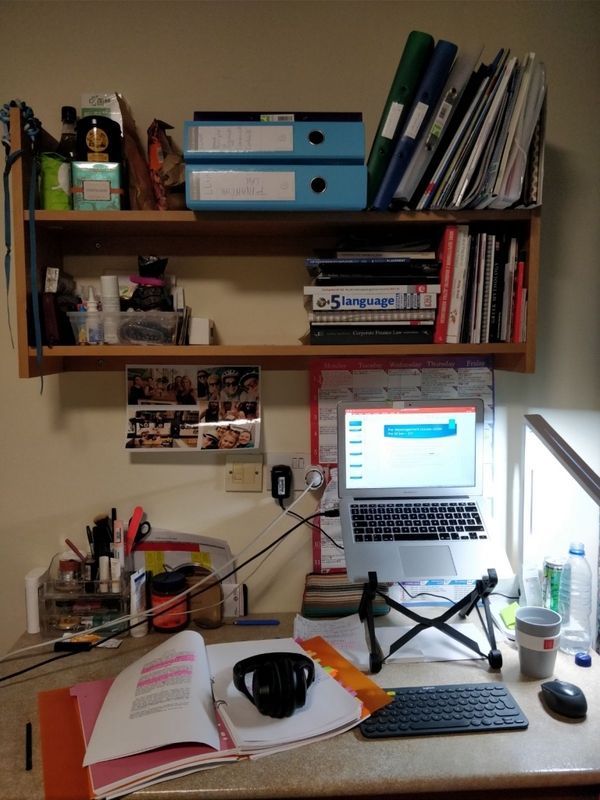 It also shows a distinguished level of creativity and brilliance sometimes mistaken for messiness and definitely underappreciated by my peers, who tend to categorize my decoration as chaotic. Emphasis on the unicorn lights and the coconut trees that are actually reminiscent of my Christmas decorations. 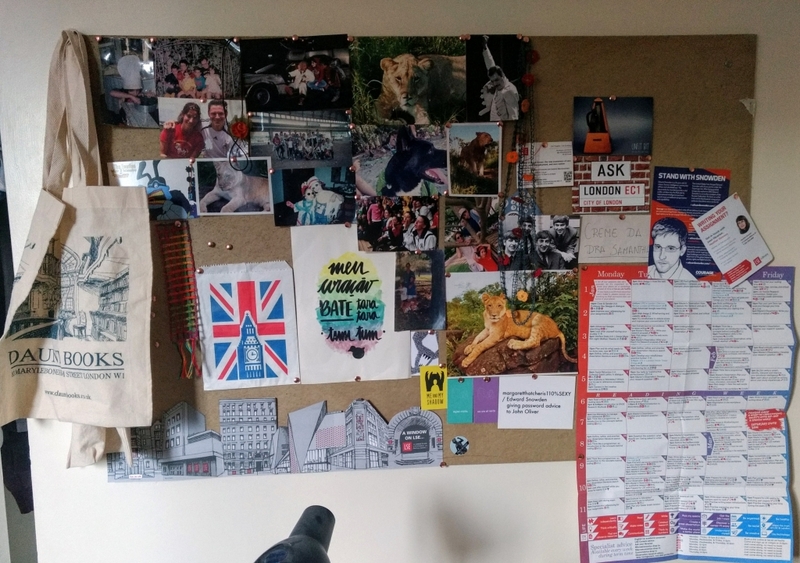 The board adds color to the environment through a selection of postcards, pictures, and random London stuff. Focus on the Snowden reference, a must for any data-student-nerd-wannabe. This setting definitely shows objectivity and organization. 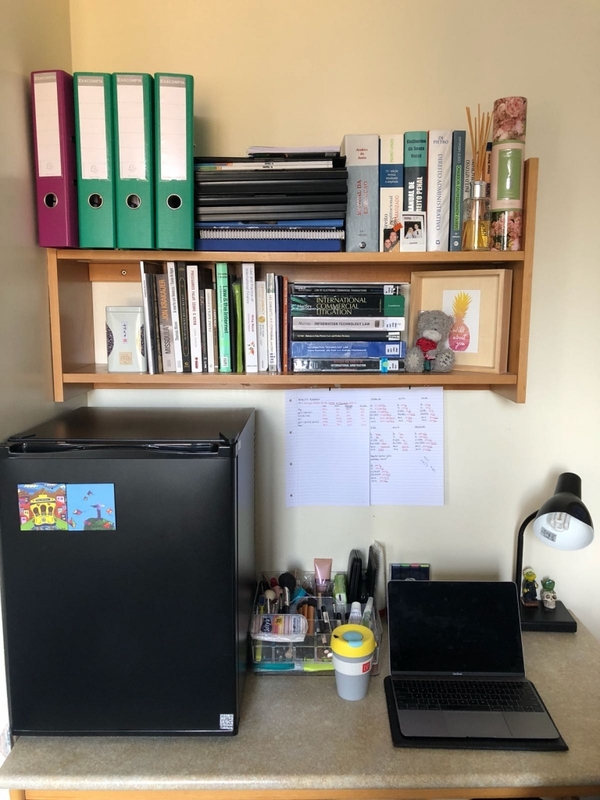 The few bright elements, such as the green and purple folders, contrast with the black fridge; clearly, the couple that inhabits this Rosebery room opts for practicality and functionality over style. A few elements grab my attention, such as the little teddy bear, the wooden sticks for perfume and the little Salamancan dolls, carefully positioned over the desk lamp. Another interesting element comes from the makeup organizer, an ingenious solution for a common problem. An edgy decoration with some classic elements. In opposition to Natalia’s sobriety, Ayesha brought artistic elements to her room decoration. The reference to Van Gogh is clearly a reminder to quit managing risks and keep her options for the future open (puns intended). The flamingo adds a somewhat natural feel to the composition – don’t mind it being made of plastic – and the red thing gives a countryside aspect to it – no idea what it is for though. 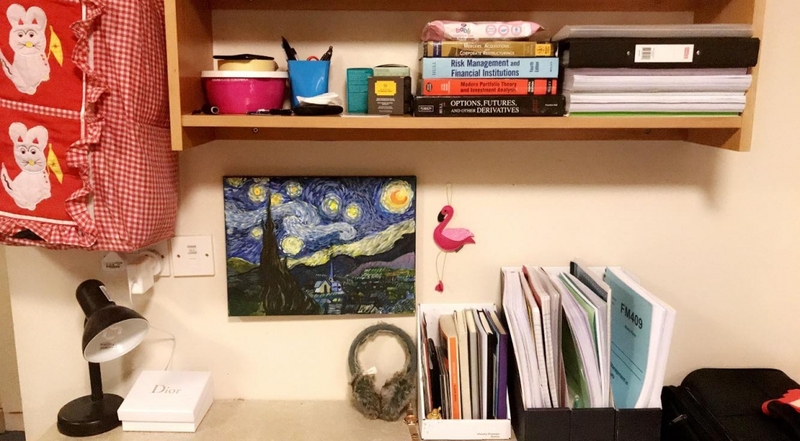 Liow has a somewhat dreamy vibe going on in her room – it might also be the picture blurs that she made sure to add, quite smartly. Underneath the map on her wall, a rustic solution to display her photographs. The earthy colors seem to be a constant in this decoration. 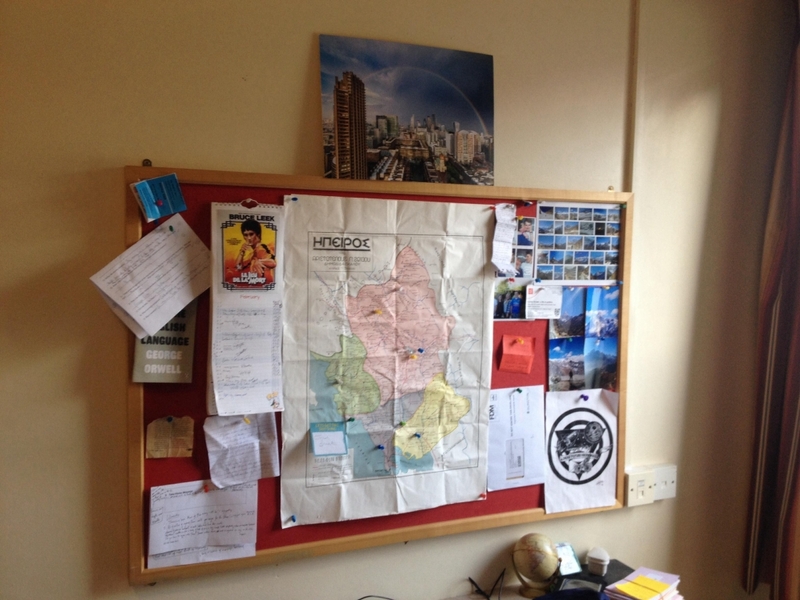 Upon the board, pictures of the places she wishes to visit. This is a very visual room with inspirational pictures everywhere. Well, I would say that the odds of Sam getting lost don’t seem too high since he has a considerable collection of maps. His decoration follows the Rosebery trend of including places he wants to visit or has already been to, and also pieces of art. 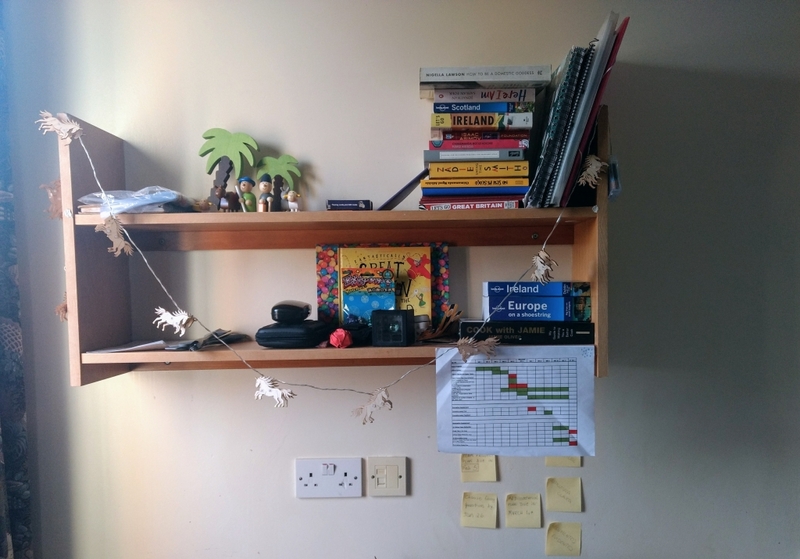 It is remarkable to notice the opposition between his shelf and his board in terms of the number of objects. Not unlike Liow, Sarah has many pictures displayed around the room in several unique compositions. The sober shades of dark in her decoration are opposed by the little butterflies in the wall. The real question that we should be asking in terms of decoration here is: did she use a ruler to measure the distance between pictures? 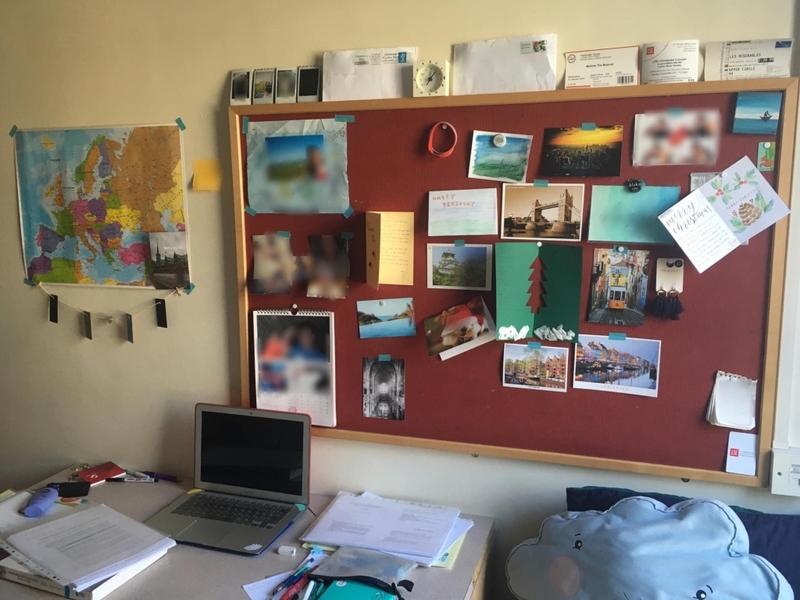 I also briefly wondered why she glued the pictures to the wall instead of using the board. Creativity is a unique feature! Sometimes the most minimalist design shows the most passion. Yannick clearly is a fan of football and of hamburgers. But other than those two sheets of paper, which I am sure are very relevant, he opts for not using the board. Maybe to keep the red pattern of decoration. 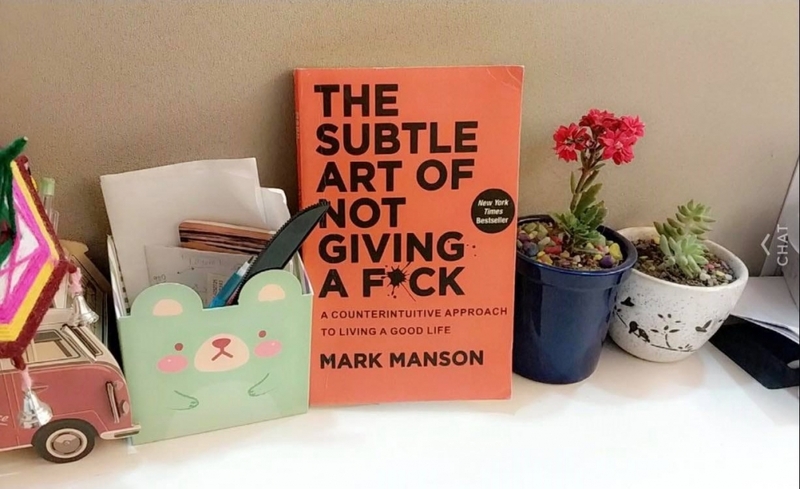 For some reason, I think that Wishva hasn’t entered the overall trend of buying fake books to decorate his shelf. I would actually bet that these are real books. Made of real paper with real stuff to read inside them. Who knew this was possible? The retro vibe doesn’t stop there though, he has something unique in this exposition which is a picture frame. I am amazed! Paula is actually my neighbor and she is a follower of Marie Kondo (KonMarie) a Japanese lady that organizes things. According to Kondo, we don’t determine where things are going to be placed, things tell us where they want to be (in my case this means that my clothes tell me that they want to be spread across the floor, what can I do?). In Paula’s case this means that things want to be placed in very neatly organized files, a computer wants to be in the air and medicine wants to be in a little box. 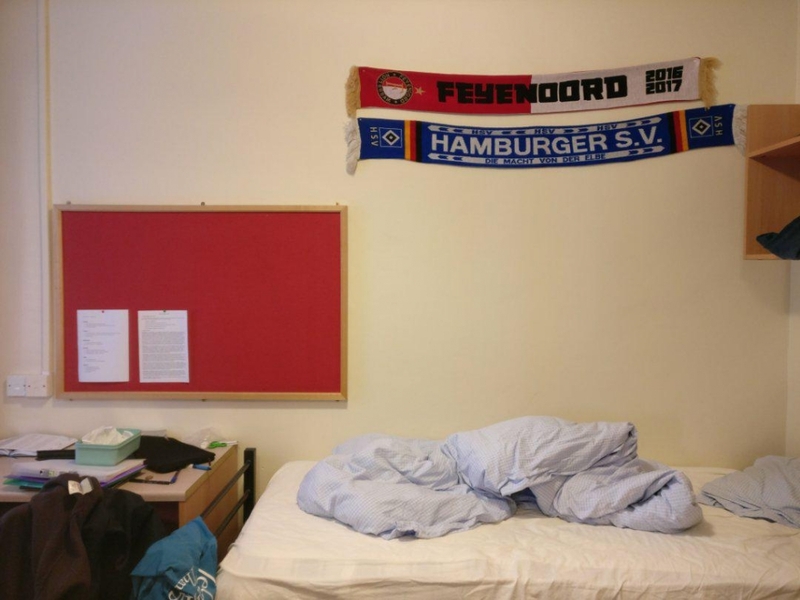 Aki’s picture shows what seems to be a big lamp, an option for badly illuminated rooms. She adorned the modern piece with a golden ribbon, a modern interpretation of a classic for sure. It is made even more modern with the giant stuffed bears in the back. Decoration is truly a work of art in itself. Jokes aside, even when two rooms are similar, they are still very different. 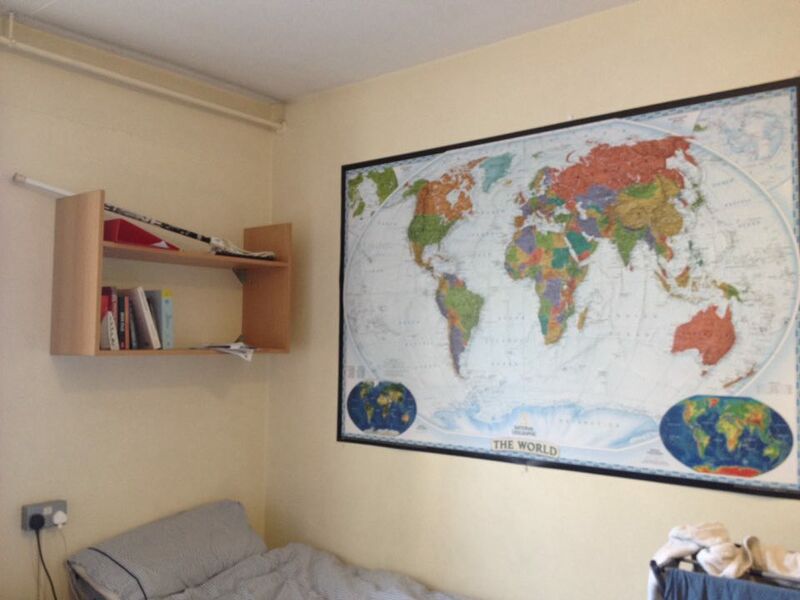 If you are planning how you will decorate your room at LSE next year, I hope this was inspiring. And I hope you found it funny.